The early twentieth century saw the emergence of a prosperous mercantile class comprised of native Vietnamese and Sino-Vietnamese. Concentrated in the south, particularly in the Saigon/Cholon area, this small but increasingly powerful merchant minority came to rely on a political culture and economic system that made them wealthy. As their numbers and influence increased they fostered the emergence of a composite French-Vietnamese-Chinese culture that over time became a source of pride for millions of Vietnamese. But it would not be without controversy. The plan for indoctrinating the natives began in the schools. Colonial versions of the French educational and legal systems were introduced and made available to the Vietnamese elite– primarily the ruling and merchant classes. Given the opportunity, many of the favored Vietnamese educated their sons, and even some of their daughters, in France. If they couldn’t go all the way to France there were a number of well respected French schools in-country available to them. The first two decades of the century saw the tenure of several liberal governors-general who encouraged the establishment of Franco-Annamite schools. Once there, young Vietnamese could obtain instruction in French and in Vietnamese, using quoc ngu texts. They were provided with a first-rate western-style education modeled after the French lycées. In addition, the French had established schools for translators where Vietnamese seeking employment with the colonial government could learn French. In demographic terms, the impact of these schools was small. No more than ten percent of Vietnamese received any formal schooling at all. But some of those who received western-based schooling were to have enormous political impact. The schools were filled with the sons of government officials and merchants, both French and Vietnamese. They became versed in the French concept of Liberté, Égalité and Fraternité. So it isn’t surprising that some of these students would become oppositional to a colonial system that looked down on and exploited the native population. These were young people for the most part, and many felt that their elders had debased themselves for French favors. The result was the emergence of a strong strain of Vietnamese self-awareness with a powerful anti-French edge. And it was the better educated who would drive the virulent anti-French sentiments as time went on. In parallel was the continuing dominance of the quoc ngu system of writing. This development was crucial to the expansion and integration of the French colonial system. It became the accepted method of notation for commercial transactions and much of the business of the colonial government. There were approximately 100,000 French bureaucrats running a country of perhaps thirty million Vietnamese. Ironically, that was possible because of the relative ease of acquiring literacy with the quoc ngu script. And while this did have the effect of indoctrinating a portion of Vietnamese society, for the French it ended up having the undesired effect of giving the Vietnamese a whole new medium within which to develop their sense of national identity. A quoc ngu based popular press emerged giving further momentum to a growing nationalism among the Vietnamese. This underground press would be a frequent target of colonial governors throughout the remainder of the French colonial period. All the while the French continued to promote the quoc ngu alphabet because it made it easier for them to govern, in a bureaucratic sense. At the same time, nationalism had become a major factor in Asia, beginning in 1911 with the Chinese Republican Revolution that overthrew the Manchu Qing Dynasty. Chinese Nationalists had participated in the Republican Revolution led by Sun Yat Sen, and sought to restore a strong central government and a sense of order. In 1917 China declared war on the Central Powers, principally Germany and Austria-Hungary, and was at least nominally among the victorious allied powers at war’s end. The Chinese were not directly involved militarily, but sent a million laborers to Europe to serve on the western front. The only fighting in China had taken place in 1914 when the Japanese took over the German concession of Tsingtao. When the war ended, they were still in possession. In 1918, when the Versailles peace negotiations began, the Chinese lobbied President Woodrow Wilson and asked for his support in forcing the Japanese to return Tsingtao to Chinese control. Wilson’s decision to side with the Japanese on Tsingtao had an immediate political impact in China, sparking mass protests on May 4th 1919, that produced the first mass political movement in Chinese history, The Fourth of May Movement. It began as an act of protest against Wilson’s diplomacy, but broadened out into a broadly-based movement determined to break with the past. The Fourth of May Movement is hailed by Chinese Communists and Nationalists alike as the beginning of modern China. Japanese territorial aggrandizement aside, many Asians, including literate, patriotic Vietnamese looked on Japan as a model to emulate. The Japanese had industrialized. The Japanese had created a modern nation. In defeating the Russians in the Russo-Japanese war of 1905, they demonstrated that yellow skin, to use the terminology of the day, does not mean that you are militarily inept, economically weak, or cowardly. It was a message that resonated with many Asians. It produced a small wave of emigration to Japan among Vietnamese patriots looking for help in overthrowing the French. Among them was Prince Cuong Di, a relative of the boy emperor Ham Nghi, smuggled out in a steamer trunk. Ultimately, however, the Japanese found imperialism to their liking and joined hands with the European powers in exploiting what today we would call third world Asian nations. For Vietnamese looking for help in overthrowing the French, Japan was a disappointment. In the 1920s and 1930s developments in Asia were dynamic and arguably even more disruptive of the existing order than events in Europe. Just as Mussolini was consolidating his power in Rome and Hitler’s Mein Kampf was causing a stir in Germany, the Chinese Nationalists entered into an alliance with the Chinese Communist Party (CCP). At the same time, Vietnamese resistance to French rule entered a whole new phase with the establishment of revolutionary anti-French communist and nationalist political parties. This is of central importance to our understanding of later developments. All future political and military events must be viewed within the context of Vietnamese political culture, the seeds of which were planted during the period under discussion. An increasing number of Vietnamese became literate. Vietnamese newspapers proliferated because the new quoc ngu alphabetized system of writing was far easier to learn than the old chu nom based on Chinese characters. Quoc ngu helped support a flourishing secular Vietnamese culture. The French censors and security forces carefully read the publications to detect signs of subversion, shutting newspapers down with regularity. And the French periodically went out and arrested people they deemed to be a threat to their rule. Out of this burst of literacy came a redefinition of what it was to be a Vietnamese. Most Vietnamese are Confucian, they may, particularly in the south, visit Buddhist temples on occasion. In the Mekong Delta, where there’s a significant Khymer minority, they may go to a Cambodian fortuneteller. In sum, most Vietnamese are Confucian at heart with an underlying strata of Taoism, Mahayana Buddhism and animism. The only major exception is in the South where Theravada Buddhism has a strong following, particularly among the poorest elements of society. A number of indigenous religious sects came into existence during the 1920s and 30s. The first of these sects to grow to political prominence was the Cao Dai religion. The foundation myth states that it began in 1919 when a spiritualist, Ngo Van Chieu allegedly saw a great eye during a séance. It was the eye of the supreme being, the Cao Dai and it announced to him that it would tell the truth only to the Vietnamese (notice the connection to the emerging Vietnamese identity) and instructed Chieu and his group to communicate with it through the medium of a beaked basket, a bamboo basket with a wooden “beak” that is used to tap out messages from beyond– much like a ouiji board. The word spread fast in spiritualist circles and the Cao Dai grew to regional dominance in the area west of Saigon. Their stronghold was around Tay Ninh. In 1925 a wealthy and self-labeled degenerate Vietnamese businessman named Ly Van Trung fell in with Chieu and his group. Trung was into opium and prostitution … then the Cao Dai appeared to him and insisted he clean up his act. Which he did; he reformed himself, swore off debauchery and became a strict vegetarian and ascetic. His miraculous conversion attracted many adherents to the movement. Predictably, the Cao Dai also told him to join Chieu in leading the movement. He did that too. It turned out that he was a dynamic leader. Trung began actively proselytizing and the movement began attracting large numbers of adherents. Chieu bowed out and relinquished his role as leader to Trung. It was the beginning of Cao Daism as a major religion. 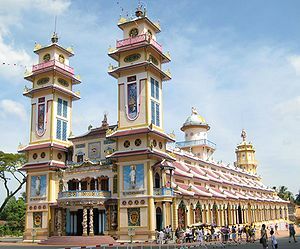 The formal name of the Cao Dai religion is Dai Dao Tam Ky Pho Do— the “Third Amnesty of God,” the first amnesty being through Moses and Christ in the west and the second through Buddha and Lao Tze (the founder of Taoism) in the east. It is a syncretic religion, borrowing elements from Christianity, Buddhism, Taoism, Confucianism and traditional animist beliefs. There is an organizational structure and hierarchy very much like the Catholic Church, with priests, bishops and a pope (the Ho Phap). The principal Cao Dai saints were Mohammad, Buddha and Christ. Their lesser saints included Marcus Aurelius, Joan of Arc, Victor Hugo, Sun Yat Sen and Thomas Jefferson. Amazing as it may seem to westerners Cao Daism was a very cohesive religion and during the 1930s its followers came to control large areas of the countryside of South Vietnam. In the years to come the Cao Dai would employ its own army to protect its turf. In time Ly Van Trung turned Cao Daism from a spiritualist group, called a cult by some, to a mass religion. It was surprisingly attractive to a younger generation of Vietnamese who were put off by Catholicism because it was the religion of their despised French rulers. They saw Confucianism and Buddhism as lacking dynamism and vibrancy, old instead of modern. And so membership passed 300,000 in the mid-1930s and was up to 2,000,000 by World War II. Perhaps not so coincidentally, there was a streak of anti-French nationalism in Cao Daism that came out in the open during World War II. Unsurprisingly, in August of 1941 the French exiled most of the senior Cao Dai leaders to Madagascar. The next and perhaps most important religious sect is the Hoa Hao. The Hoa Hao religion was fundamentally a reaction against the more blatant excesses of temple-based Theravada Buddhism. All the way back to the 1800s, and probably long before that, there were mystics in the region who believed and preached that villagers should adopt a more spiritual outlook and practice a more communitarian way of life. That outlook was closer to Mahayana Buddhism than to Theravada. Then, in the late 1930s, a sickly young man named Huynh Phu So, from the village of Hoa Hao in the Mekong Delta, was committed by his father to the care of a local monk to see if the monk could effect a cure. The monk in question happened to be a follower of the teachings of the original Buddha Master of Western Peace. According to the story, Huynh Pho So had a miraculous conversion experience in the course of which his health was restored. He then declared himself a disciple of the Buddha Master and set about preaching a reformed version of Buddhism very much in line with the original master’s teachings. Huynh Phu So, it turned out, was dynamic, charismatic, and a spell-binding preacher. The “new” religion had enormous attraction to the downtrodden peasants of the delta because, like with the Cao Dai, it had a strong undercurrent of anti-French nationalism. And Huynh Pu So—who soon became known as “the Mad Monk”—quickly gained a mass following in the area south of Saigon. His following grew during World War II, helped along by his accurate prophecies of French defeat in 1940, the Japanese occupation, and the arrival of the Americans. He was seemingly a simple fellow, and yet he was brilliant. The French became very concerned when thousands and thousands of people flocked to this apparently simple country preacher. They considered him a threat to their rule and imprisoned him. But they couldn’t imprison him for breaking the law; he was too smart for that and refused to give them the excuse they needed. The French solution was to have him declared insane and confined to a psychiatric prison. The Japanese forced the French to release Huynh Phu So. The Hoa Hao movement gained more traction. And anti-French edge in the Mad Monk’s sermons got progressively sharper. Looking ahead, during WWII the Vietminh would claim that the Japanese supported the Hoa Hao, that they were collaborators, in some measure because of the Japanese role in forcing his release from French prison. For their part, the Vietminh feared the Hoa Hao as political rivals. Over the years there were some bloody clashes between the Vietminh and the Hoa Hao in the Mekong Delta. In September 1945, during the chaos at war’s end, the Vietminh, heavily armed with automatic weapons, fought the Hoa Hao, who were wielding with scythes, pitchforks, and flails. By 1946-47 the Hoa Hao were the biggest of the sects and controlled large sections of the Mekong Delta provinces. They would continue to be a bulwark against the communists. Then there was the Binh Xuyen. The French, for the sake of categorization, labeled the organization a religious sect, but it was hardly that. The Binh Xuyen were basically a protection racket, a home-grown local mafia who got their start in the village of Binh Xuyen south of Saigon. At first we are talking a band of thugs getting fat on protection money levied on intimidated peasants. Later, under the leadership of the legendary Bay Vien, they muscled into the rackets in Saigon: gambling, prostitution, opium, and so on. They became increasingly powerful and the French began to look the other way. The French chose instead to cut the Binh Xuyen in on some of the action. So the Binh Xuyen ran the opium trade, and the numbers rackets, and the call-girls and the French got their cut, and plenty more in the way of recreation. The Binh Xuyen are an interesting phenomenon. On one level, they were an organized crime syndicate and yet they were motivated in part by patriotism. They had a close relationship with the Emperor Bao Dai, who also found it expedient to let Bay Vien run the rackets. And like the Cao Dai the Binh Xuyen went along with the Vietminh at first, but they too ultimately broke with them. After the Bolsheviks’ rise to power in Russia and the creation of the Soviet Union in 1917, the Communists then defeated the White opposition in a long, bloody and immensely destructive Civil War. The principal architects of communist victory were Vladimir Lenin and Leon Trotsky, Lenin for providing the intellectual framework for revolution and consolidation and leadership at the top and Trotsky for organizing the Red Army and leading it to victory over the Whites. In March of 1919, Lenin presided over the foundation of the Comintern, an organization dedicated to world wide social revolution on the communist model and backed by the might of the Soviet Union. There were Marxist movements in Asia before the Comintern. The Marxist Partai Kommunis Indonesia (PKI), literally, Indonesian Communist Party, was founded in 1914 and by the 1930s was one of the largest Marxist parties in the world. Through the 1920s and ‘30s Marxist revolutionaries, both Moscow-trained and home-grown, circulated throughout Asia, organizing and propagandizing. Central to our story, 1925 saw the simultaneous creation of Vietnamese proto-communist parties in Annam and, independently, among Vietnamese exiles in Canton, with none other than Ho Chi Minh presiding. But all the action wasn’t on the left. In 1925, a Vietnamese Nationalist Party, the Viet Nam Quoc Dan Dang, or VNQDD, was founded by anti-French nationalists in Canton. The VNQDD were inspired by Sun Yat Sen and the Chinese Nationalists, the Kuomintang (pronounced in Vietnamese Viet Nam Quoc Dan Dang sounds like Kuomintang), and funded in part by the Kuomintang as well. The VNQDD were every bit as serious about overthrowing the French as the communists, but parted company with them on the question of communal ownership of property. They drew most of their rank and file support from among low-ranking government officials and indigenous soldiers in the French colonial army. Unlike the communists they gave significant leadership roles to women; very traditional; shades of the Trung sisters and Lady Trieu Anh! – Ho Born in Nghe An Province in 1892 or ’93 as Nguyen Tat Thanh; Left Vietnam in 1912, not to return until 1941; Present in Paris during the Versailles Treaty negotiations; Read Lenin’s Thesis on National and Colonial Questions while in Paris, converting to Marxist-Leninism; Founding member of French Communist Party; Organized Vietnam Revolutionary Youth Association, Canton, 1925; Founded Indochinese Communist Party. Nguyen Tat Thanh, aka Ho Chi Minh, is remembered in history as the ascetic, almost saintly, Uncle Ho, with scrawny physique, rubber-soled sandals, burning eyes, grandfatherly beard and uncanny powers of persuasion. On the surface much of that image was true– Uncle Ho was an ardent Vietnamese patriot, he never married and devoted his life to the struggle to free his people from oppression– Ho was also an organizational genius. Not only did he preside over the creation of the Indochinese Communist Party (ICP)—later the Vietnamese Communist Party — Ho then led it to victory against the French and throughout much of American phase of the war. Most of what we know about Ho comes to us through communist sources and texts, mostly written after victory over the French in 1954. The only major exception is for the period 1945-46 when he was in regular contact with American and French intelligence officials, diplomats, and reporters. Ho was born Nguyên Tat Thanh, the son of a Mandarin from a reasonably prosperous rice-growing family, in Nam Dinh district of Nghe Anh Province. His official birthday is 19 May 1890. He received a traditional Sino-Vietnamese education from his father, a senior court mandarin known for his command of Chinese orthography. It must have been a good one, for Ho apparently mastered the traditional chu nom system of writing. Ho’s father was later appointed to a provincial post and later dismissed in disgrace– the reason why remains a question. Before his father’s disgrace, Ho enrolled in what was probably the best secondary school available to any Vietnamese who valued a rigorous western-style education, the Lycée Quôc-Hoc in Vinh. The Lycée was founded by Ngo Dinh Kha, a high imperial court mandarin and father of Ngo Dinh Diem, later to be president of South Vietnam. It was an incubator of anti-French sentiment. In addition to Ho, the list of attendees included Vo Nguyen Giap, victor over the French at Dien Bien Phu; Phan Van Dong, Ho’s right hand man and the aforementioned Ngo Dinh Diem. Ho was dis-enrolled from the school after his father’s disgrace in what must have been a painful experience for the young man. Ho left Vietnam in 1912 as a mess boy aboard the French ship Admiral Latour Tréville, traveled the world, and didn’t come back to Vietnam until 1941. His biographers have presented him as an ardent hater of the French from the beginning, but there is some reason to believe that at this early point in his life he may have believed that the Vietnamese could attain a higher level of development and better life by working in cooperation with the French. The evidence is scanty but it appears that Ho lived back and forth between New York and London between 1912-17. It is known that he worked in a restaurant in New York City. It is fairly certain that Ho visited Harlem during this period and may have known of the doings of Marcus Garvey. During his stay he wrote a perceptive essay on the new Klu Klux Klan in America. It’s a solid analysis of what drew whites into the new Klan. The young Ho displayed a keen perception of his new country. He clearly understood the connection between social discontent and racial prejudice in America. His time in America and Ho’s study of the Ku Klux Klan influenced his feelings about this country down through the years. I dare say that Ho understood us much better than we ever understood his Vietnamese people. Ho also lived in London for a time after 1913. He actually worked in the kitchen of the Carleton Hotel under the great French chef Georges Escoffier. He rose to the rank of chief pastry chef, no mean achievement. Along with his other abilities, Uncle Ho was a world class cook! Between New York and London, he became fluent in English. His letters have him mastering English while in London—and at a high level of literacy, English is a very difficult language to master—but by 1944 he was conversing with Americans in perfect American English. By 1917 or early 1918, Ho was in Paris. He lived with a group of fellow Vietnamese expatriates, making his living by retouching photographs. At the end of the Great War, when the Versailles negotiations began, Ho and his colleagues sent a petition to the main national delegations calling for greater Vietnamese autonomy under the French. They collectively signed the petition Nguyen Ai Quoc, Nguyen the Patriot. They received a polite acknowledgment from President Wilson’s chief of staff and that was all. Wilson had been talking a good game, his Fourteen Points and seeming advocacy for self-determination had raised great hopes throughout the third world, but what came out of Versailles was a bitter pill to swallow for most– the Vietnamese included. The rejection of the petition must have had a dissilusioning effect on Ho, but how that influenced him we can only speculate. In May of 1920, he read Lenin’s essay, Thesis on the National and Colonial Problems, published in the leftist newspaper L’Humanité . It changed his life. Ho would later pinpoint his conversion to communism to that moment. A product of the Second Comintern Congress, the essay marked a pivotal change in the party line. In it, Lenin argued that imperialism, the economic exploitation of colonial peoples, was the highest form of capitalism. He further argued that since the level of economic development in Europe’s colonies had not progressed beyond agrarian feudalism, the communists could ally with patriotic bourgeoise to overthrow the existing order. Once the bourgeoise revolution had achieved national independence, the socialist revolution could begin. Lenin further argued that if workers in the newly-liberated colonies were assisted by developed communist states—i.e. the Soviet Union —they might be able to bypass capitalism altogether and move directly to socialism. It was the birth of the popular front. Lenin’s essay fit in perfectly with Ho’s thinking and experiences. By linking resistance to colonial exploitation to class struggle, he showed how nationalist resentment of the colonial power by exploited peoples might be harnessed to support broad-based resistance. Ho became a master at building these resistance movements and may have been the most ingenious and successful technician of the popular front method the world has ever known! Fully indoctrinated, Ho soon appropriated the pseudonym Nguyen Ai Quoc for himself. During his long revolutionary career, he used as many as a dozen aliases to throw the authorities off his trail and with considerable success. Nguyen Ai Quoc was the most effective alias, the mythic figure came to be revered by peasants, students, and rebels and feared by the colonial authorities. Ho’s life at this time is so mysterious, with so many possible trails to follow, that some have argued that he may have actually been several different people! In fact, at one point later in his life, the British police, completely befuddled by so many aliases, lost track of Ho while in jail in Hong Kong and reported that he had died. Ho had joined the French Socialist Party by 1920. When the Socialist party convened at Tours on Christmas Day to consider whether or not to align with the Comintern Ho was there. Under the suspicious eyes of the French police, who followed his every move, the young Asian radical announced his allegiance to the principles of Lenin’s new Communist International in a speech that called for a working class movement aimed at the liberation of colonial peoples. An open split emerged at Tours that resulted in the formation on December 30th of the French Communist Party. Ho Chi Minh was a charter member. In early 1924 Ho finally made it to Moscow. It is probable that he avoided any affiliation with Leon Trotsky and his faction– he was not targeted during Stalin’s purges. Whether that was by design or just luck is not known. We do know that he became affiliated with the Krestintern, the Comintern-affiliated international peasant’s union, and that he petitioned Comintern officials to dispatch him to China, where he sought to engage in training expatriate Vietnamese in furtherance of the communist revolution. Ho was dispatched to Canton as a translator for the Russian Telegraphic Agency, a precursor to the official Soviet TASS news agency. Arriving in November of 1924 with instructions to work for the Guomindang (GMD), Ho immediately began recruiting Vietnamese exiles and training them to return to Vietnam to do the work of the revolution. He recruited promising youth as trainees, trained them in the art of clandestine political organization and revolutionary doctrine, then sent them into Vietnam to do their revolutionary work and to identify additional recruits to be sent north to China for indoctrination and training. At this stage Ho was a disciplined communist. The evidence suggests that those of his recruits whom he considered unreliable or who rejected communism were betrayed to the Sûreté and quickly arrested and imprisoned after entering French territory. He was so trusted as an agent that was given an independent charter to preside over the founding, in June of 1925, of the Viet Nam Than Nien Cach Mang Dong Hoi, “Assocation of Vietnamese Youth”– generally called Than Nien (“Youth”) for short. This was the beginning of the ICP. Then in the spring of 1927, Nationalist leader Chaing Kai-Shek, in a pre-emptive strike against the prospect of a Communist takeover of the GMD from within, launched a bloody war against his former CCP allies. In the ensuing purge of communists ordinary Than Nien members were not directly affected but those with open communist party affiliation were forced to flee, Ho among them. Ho’s movements after his return to Moscow are unclear; he apparently lived in Germany for a time. In May of 1928, he was back in Asia and was working among the Vietnamese exile community in Northeastern Thailand. Most likely he was there working in collaboration with agents of the CCP assigned to recruit and manage the expatriate Chinese of the region. His timing was good: Ho departed for Asia just as Stalin’s purge of Trotskyites was getting under way and shortly before Stalin ordered the popular front line abandoned in favor of class struggle, a line that forbade cooperation with patriotic bourgeoiese or their political parties. As has repeatedly been the case in the history of the Left friction was mounting between the various Vietnamese communist organizations in Vietnam and China. There were three significant factions, each with its own interpretation of the party line and hence there was a need for a trusted comrade to referee and restore unity, by force if required. Ho Chi Minh, better known as Nguyen Ai Quoc, was the most prestigious Comintern agent in the region and messengers were dispatched to Thailand to call him back to China. Ho heeded the call, and at a series of meetings in Hong Kong in early February 1930, he brought the three principal factions together as the Viet Nam Cong San Dang (Vietnamese Communist Party). The unifying party line called for the overthrow of the French by a bourgeoise-democratic revolution led by the working class, following which the feudal regime would be abolished and Vietnam would advance directly to socialism without passing through the capitalist phase. The Central Committee moved from Hong Kong to Saigon. The first use of armed violence against the French by the new revolutionary organizations came in early 1929, and from an unexpected faction. It was in response to French colonists practice of coercing impoverished Vietnamese into signing long term contracts that committed them to servitude. It was all perfectly legal under French colonial law. Labor contractors who operated openly delivered workers in the thousands to the owners of plantations and mines on a routine basis. During the 1929 Tet festivities, a VNQDD agent sidled up to one René Bazin, the director of a labor bureau that shipped large numbers of Vietnamese off to the plantatinos of New Caledonia. The VNQDD man pulled out a gun and killed the Frenchman. He stuck a note to Bazin’s pocket condemning his activities and claiming credit for his murder to the VNQDD. Bazin was notorious, at least among informed Vietnamese, and the note laid out the reasons justifying his assassination in some detail. News of the murder had serious impact, not the least of all on the Communists. By 1930 there were revolutionaries ready, willing and able to take up arms against the French. Bazin’s murder lit a powder keg. Revolution was in the air. But violence was not the exclusive domain of the Left. In fact, the conservative VNQDD were first off the mark. In February, acting under VNQDD leadership, two companies of Vietnamese colonial soldiers mutinied at the post of Yen Bay on the Red River, killing their officers and occupying the post. The French retaliated with extreme force, razing the mutineers command village by aerial bombardment. All the while they were desperately attempting to learn more about the VNQDD, of whom they knew little. A couple of months later the Communists sponsored May Day demonstrations all over the country. Participation was enthusiastic and in many places anti-French violence broke out. Between May and September the Communists organized agricultural collectives, or Soviets, in Nghe Anh Province and neighboring Ha Tinh to the south. The French responded by bringing in the Foreign Legion. By year’s end the French had pretty much smashed the soviets. In a strange way, the French might have been the beneficiary of good timing here– they may have been helped by the doctrinal change decreed by Moscow emphasizing the practice of class warfare over popular front tactics. Word of that important change reached cadres just as the fighting was at its peak in September and October. Suddenly there was division in the ranks which was accompanied by a bloody internal purge of intellectuals, rich peasants, landlords and other collaborators. The ferocity of the class warfare-inspired purge seems to have turned significant numbers of peasants against the Communists, signficantly aiding the French in suppressing the rebellion. Not content with the mere crushing of the uprisings, the French unleashed a wave of repression in which both the VNQDD and Communists were severely hurt. The VNQDD were all but eliminated as a factor in internal affairs; Communists had to flee the country to avoid death or prison. For Communists and Nationalists alike, the 1930 uprisings were a total debacle. 1930 was a major setback for the ICP in more ways than one. In addition to having their cadres killed, imprisoned and dispersed, the ICP was reduced in status within the hierarchy of international communism, reduced from an independent entity to a sub-section of the French Communist Party. How was Ho affected by this? The leadership that ordered the uprising had been killed, imprisoned or discredited, but Ho Chi Minh was out of the country and clean. As fate would have it, the British arrested him in Hong Kong in June 1931 on unrelated charges. That put him out of circulation for an extended period. Nguyen the Patriot was released by the British in 1932 through the good offices of a competent British lawyer, one Fred Lozeby working for the organization Red Aid. Lozeby pointed out that Ho had not violated Hong Kong’s laws, and ultimately British justice prevailed. Ho was released and Lozeby gave him passage money and false documents that allowed him to give the Sûreté the slip. Ho then made his way back to Moscow. In a twist of fate his “death” in jail in Hong Kong was reported in error by the British Communist newspaper Daily Worker in August 1932. This caused great anxiety and consternation among the cadres. By the time Ho arrived in Moscow in July 1934, the international situation and Stalin’s response to it had changed dramatically. Frightened by the rise of the Nazis and Hitler’s ascent to power, in 1933, Stalin, in a complete turnaround, reversed his field and instructed national parties to abandon the class struggle line and support national revolutions under the banner of the popular front. The Comintern loyally followed suit. Under Comintern orders, the ICP reverted to popular front tactics, dispatching agents from Moscow to China to engage in the work of recruiting and training Vietnamese communists for dispatch into French Indochina. In early 1936, one Le Hong Phong, one of Ho’s early recruits, who had risen in rank to the position of First Secretary in absentia of the ICP, was dispatched from Moscow to Nanjing (Nanking) with instructions to form an anti-imperialist front organization under GMD sponsorship. This he did, founding the Viet Nam Doc Lap Dong Minh Hoi. the Vietnamese Independence League, Vietminh for short. This very early version of the Vietminh included in membership a number of prominent GMD officers with communist sympathies along with Vietnamese communists in exile. The ideological divide between communist and nationalist was blurring . This Vietminh soon lapsed into inactivity, but remained on the Nationalist books as an approved organization. Uncle ho would take advantage of this seemingly minor point a few years later. Le Hong Phong went on to new assignments in southern China and then into Vietnam. He was arrested in 1938, released and then re-arrested in 1939 and died in prison on Con Son Island in 1942. Meanwhile, in Moscow the free-wheeling intellectual atmosphere of the 1920s had given way to the oppressive suspicion and dread of the 1930s as Stalin ruthlessely rooted out all political and ideological opposition, both real and imagined, in his infamous purges. Ho survived, serving as an instructor in various Comintern schools. He was clearly not high in the ICP hierarchy at the time, and his low ideological profile would have certainly helped his cause. Military and political developments over the next couple of years were fast-paced. In June 1936, a Popular Front Government under socialist Leon Blum came to power in Paris and appointed a man named Jules Brevié Governor General in the colony. Brevié then released thousands of political prisoners and gave leftist revolutionary parties unprecedented freedom. In Tonkin, Vo Nguyen Giap and Pham Van Dong were able to operate openly at the head of the Indochinese Democratic Front. In Cochinchina, the ICP entered into an alliance with Trotskites to pressure the French into accepting reforms. This Popular Front government in Paris lasted barely a year. International developments soon forced yet another change in the party line. The driving factor was Stalin’s failure to bring the western democracies into an alliance against Nazi Germany in fields and cities of Spain. Stalin had gambled by intervening militarily in the Spanish Civil War in the summer of 1936 in a play to push America, Britain, and France into forming a bullwark against the growing scourge of Fascism. By 1938 it was clear that the British wanted no part of it and they made sure that the French and Americans followed along accordingly. The European Democracies paid a heavy price for the British stance on Spain. By 1938 capitulation to a much stronger Hitler was frequent. The incorporation of Austria into the Third Reich in February and the signing of the infamous Munich accords selling out Czechoslovakia set Europe on it’s tragic course. Then, after being backed into a corner, Stalin allied with Germany in the infamous Nazi-Soviet Non-Aggression Pact of 23 August 1939– the Molotov-Ribbentrop pact. The invasion of Poland followed on 1 September and World War II was on in Europe. Having entered into a treaty guaranteeing Polish sovereignty, France and Britain were obliged to declare war on Germany, and by extension the Soviet Union. In late September, the French government outlawed the Communist Party in France. This had immediate repercussions in Indochina. In September 1938, at his request Ho was sent to China as a Comintern emissary to the ICP, with instructions to form a “national democratic front.” The increasing military tempo of the Sino-Japanese War left him little room to implement his plans. He was recruited to serve as a major in the Communist 8th Route Army, performing mid-level staff duties while presumably continuing to train communist agents and send them south towards Vietnam. The ICP took a solid stance against French imperialism while the French change of policy led to a police crackdown in Indochina. But, in contrast to 1930, there was advance warning; most cadres had gone underground and survived. Even so, the crackdown left the ICP separated geographically. A significant body of expatriate communists operated from southeastern China. Others were inside Vietnam in Saigon and Hanoi, and communication among the groups was slow and unreliable, depending entirely upon couriers. So, this is the way things stood when the Germans over-ran France. Which we will talk about next time…. Buttinger, Joseph. Vietnam – A Political History. Duiker, William J. Ho Chi Minh. LaCouture, Jean. Ho Chi Minh: A Political Biography. Marr, David. Vietnam: Tradition on Trial.